The intention to create the GNU System, and the concept of free software, was first announced in September 1983. Since then, it has grown into a global movement of people that work together for software freedom, and have a great time doing it. Last weekend, this beautiful community gathered all around the planet to celebrate GNU's 30th birthday. The FSF held a flagship celebration at MIT in Massachusetts, the original home of the GNU System before it became a global phenomenon. The event featured a hackathon focused on federated publishing and communication software, and tools to protect privacy and anonymity. Hackathon participants accessed the Internet through an ad-hoc mesh network set up by the folks from Commotion Wireless. A cryptoparty helped participants protect their information online and an F-Droid tutorial and skillshare introduced attendees to free software for mobile devices. Aleph Objects used their Respects Your Freedom-certified Lulzbots to 3D-print GNU toppers for birthday cupcakes, and the FSF's real-live gnu posed for photo-ops. MIT's Student Information Processing Board hosted the event for us, and helped us get an animated birthday message displayed on the side of a building. Ten free software projects held simultaneous hackathons in Cambridge; Commotion, coreboot, Gnash, GNOME, GNU FM, GNU MediaGoblin, GNU Octave, GNU social, Tahoe-LAFS, and Tor, with Guix participating simultaneously online. One of the most exciting outcomes of the hackathon was the cross-pollination that happened between projects. Tor hackers helped Tahoe-LAFS identify some security issues. Gnash tested a new release on different distributions brought in by hackathon attendees. Progress was also made on Debian packaging for GNU MediaGoblin. Other projects had people stop by to fix bugs, and everyone enjoyed the rare opportunity for in-person conversation between contributors who hail from all over the globe. The weekend culminated with an address by GNU founder Richard Stallman, in which he announced that privacy and security--especially against government surveillance--is now one of the GNU's project's primary purposes. Free software is one of the most important tools we have to protect ourselves against surveillance, and the address reflected an ongoing mobilization in the community to meet these challenges. The talk was livestreamed by hundreds of people, many of them outside the United States. But GNU supporters around the world did more than watch RMS's talk. In total, twenty-three groups held events in Argentina, Australia, Bangladesh, Brazil, Bulgaria, Canada, the Czech Republic, France, Germany, Italy, Japan, Moldova, Portugal, Romania, Saudi Arabia, Spain, Switzerland, Tunisia, Turkey and the United States. That's at least one satellite event on every continent, except Antarctica. (We fully expect that, by GNU's 60th, there will be at least a few in Antarctica, and maybe some on Mars.) You can see photos and video from GNU 30th celebrations around the world on libreplanet.org. In Spain, hackers projected a GNU image on the side of a building. In Saudi Arabia, supporters baked a beautiful GNU cake. In Argentina, GNU contributors gathered at a makerspace and led their own hackathon. All in all, GNU's 30th was an inspiring convergence of people spread throughout the whole world, united by a common goal to set software free. The FSF would like to extend a big thank GNU to everyone that has made GNU possible with your time and energy. We are particularly grateful to the people that helped us with the MIT celebration. We hope you enjoy the photos, and here's to the next thirty years! All photos under CC BY-SA 3.0. 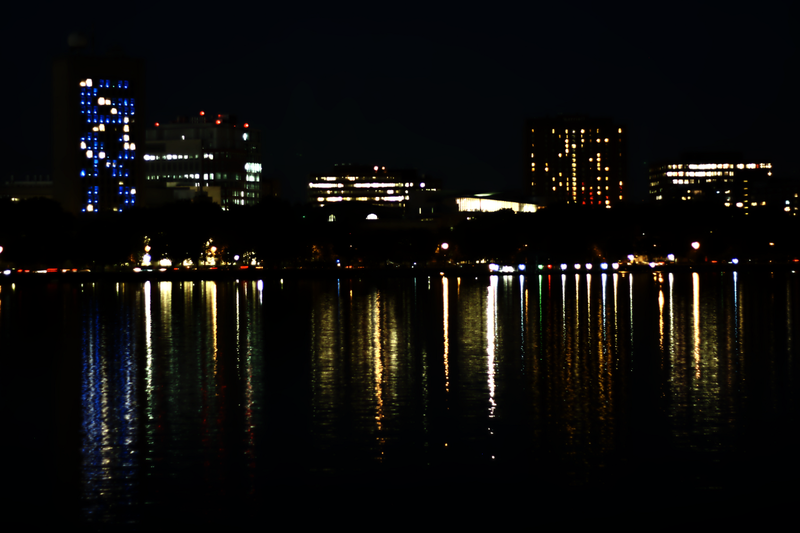 Photo of the Boston skyline: Elizabeth Redlich. Cake photo: Osama Khalid. All others: Libby Reinish.